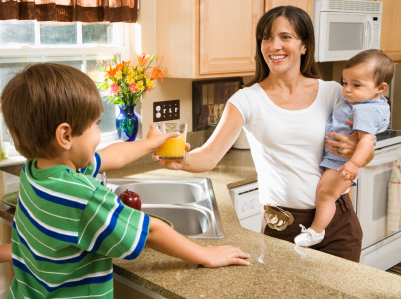 When you are hiring a nanny to work in your home, it is very important to plan what you will ask each candidate. Interviewing an in-home caregiver is so different than a typical job interview. Not only will you want to hear about her/his experience, you will want to know about their childcare knowledge and personality. Your relationship with your nanny is as important as the nanny’s relationship with your children. We encourage you to keep questions open ended and see how comfortable you are with the responses. Over the years, we have developed a healthy list of interview questions that we provide to each of the families we work with, along with other valuable nanny employer information. Below are some of our favorites! How might you help my children learn? What activities would you engage in with a newborn/infant/toddler? How do you react to temper tantrums (esp. in public)? Do you have any favorite rainy day activities for toddlers? How would you handle an emergency? Have you ever had to handle an emergency? If so, what happened and what action did you take? What would you do if the child got sick and had a fever? What activities would you do with the child(ren) during the day (describe a typical day)? My two year-old simply won’t go down for his nap and you know he’s ready. How are you going to handle it? My baby is colicky and hasn’t stopped crying since you arrived three hours ago. What will you do to calm her? What would you prepare for (breakfast, lunch and/or dinner) for a child the age of X? What do you believe is an appropriate snack for a child the age of X? Do you have any children of your own? If so, how old are they? What are they doing now? Do you have child care? Do you swim? Well enough to supervise children? How do you feel about minding our pet? Do you have a special diet of any kind? What would you do if a friend of yours dropped by while you were working, in a situation that was not child-related? We would love to walk your family though a nanny placement, offering advice, standard industry practices, tried and true processes, and a large pool of exceptional, 10-step screened nannies. Please complete a Mom’s Best Friend Contact Us form or call our office for more information.